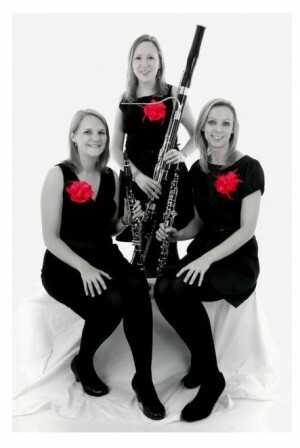 The Marylebone Trio is a classical woodwind trio formed in 2003 by postgraduate students at the Royal Academy of Music. Since then the trio has been working regularly together, touring the UK and beyond giving recitals, running education concerts and workshops and providing music for weddings and other events. Concert performances have included well-received recitals at music festivals in Deal, Stratford-upon-Avon and Church Stretton; London venues including Kings Place and the National Portrait Gallery; and numerous music clubs and societies around England. Many audience members have appreciated hearing an ensemble that is a bit different from their usual diet of strings and piano, and enjoyed the trio’s lively presentation style. The trio’s concert repertoire includes music by well-known composers such as Mozart, Schubert and Beethoven; several gems from 20th-century France, Britain and eastern Europe; and contemporary works that have been commissioned for the group. For more information, see our concerts page. The trio is also enthusiastic and passionate about encouraging the next generation, and has a wide range of education work, from concerts to introduce the instruments to primary-age children to working on chamber music techniques with specialist musicians at performing arts colleges and secondary schools. We have also run our own chamber music course for adults and children several times. For more information, see our education and outreach page. Away from the concert platform, the trio frequently provides music for wedding ceremonies and receptions, and other family occasions and corporate events. These have included a garden party in the presence of HRH Prince Edward, a masked ball at the Dorchester Hotel and a special event for Chiltern Railways at – of course! – Marylebone station. The trio are frequent guest entertainers on board Saga cruise ships and have travelled to countries near and far including Australia, Hong Kong, Russia and the Scandinavian countries. Our arrangements include classical favourites, jazz and show tunes and pop arrangements, so there should be something for all tastes! For more information, see our weddings and functions page.